Neutrogena is a member of the Johnson & Johnson company line. They are the #1 dermatologist-recommended skin care brand. Their products are manufactured and sold in more than 70 countries. 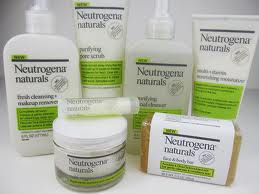 Neutrogena Naturals is a new skin care line for the more sensitive skins. I received a few products of their new Naturals line for review from Klout. It was a perk I received. I'm so glad I did too. I am always on the hunt for a good product for cleaning my skin and making it feel soft all throughout the day. At my age, 35, I thought acne and problem skin would be gone, but it isn't. I didn't have much until later in life and always try to take care of my skin. I find this Neutrogena line helps do exactly what I look for, it cleans, and you notice it, and it leaves my skin so soft. And not just for a minute, for most of the day actually. I definitely am going to stick with Neutrogena for now. It is the best I have used so far. DISCLAIMER: I received products from Klout as perks. I was not compensated for this post or my opinion. I use the wash and I loooooooooooove it. I'm 40 and still struggle with the occasional breakout. My family was blessed with good skin -- in that it doesn't wrinkle for a long time. My grandmother just had a few around her eyes and that sort of thing. I hope I'm that lucky. Good products help.